Mercy was granted an opportunity to serve through Summits Therapy Animal Services tonight. 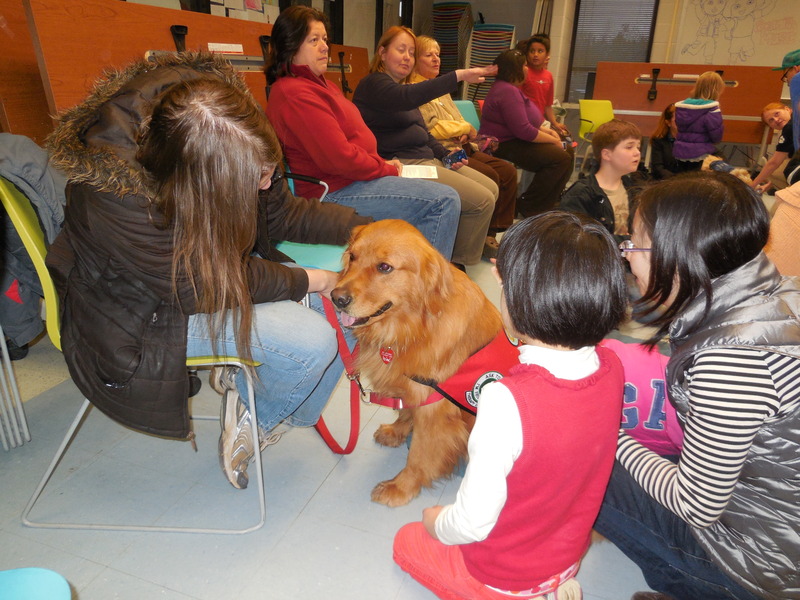 She visited with special needs kids at a special therapy dog event at a local community center. There were other dogs there and there was even a miniature horse! Mercy displayed the virtues of Jesus Christ including patience, grace, and mercy. She was happy to be with then as Jesus was in Mark 10:13-16. There was one kid who tried to poke her in the eye. Mercy still accepted him unconditionally. Friendly dogs accept people without judging them, no matter what mistakes they make. I thank God for this opportunity. I just know with your prayers that He will continue to open doors for me and Mercy! Jesus (and Mercy) loves the little children, all the children of the world! Yellow, red, black and white, they’re all precious in his sight. Jesus loves the little children of the world! This entry was posted in Acceptance, Animal Assisted Therapy, Autism, Beauty, Believe, Career, Comfort, Compassion, Destiny, God's Glory, God's Kingdom, God's Love, Golden Retriever, Grace, Healing, Health, Inspirational, Love, Mercy, Ministry, Purpose, Serving, Solace, soothing, Special needs kids, Therapy and tagged Acceptance, Golden Retrievers., Grace, Jesus Christ, Love, Loving, Mark 10:13-16, Mercy, Special needs kids, Unconditional Love. Bookmark the permalink. 1 Response to Mercy, the Epitome of Grace!